I thought I’d change gears and write some fun stuff about Cayden. I’ve said how he was such a fun and super kid, but he really was! He was a sweet sweet boy who definitely had personality. His personality really blossomed when he began to hear, and just kept getting bigger! Mommy & C, last Mother’s Day as an only child. He loved his Momma. I know, I put myself first. But really, Cayden was a momma’s boy! He was always with me, more than a typical child would be, and really I loved hanging out with him. 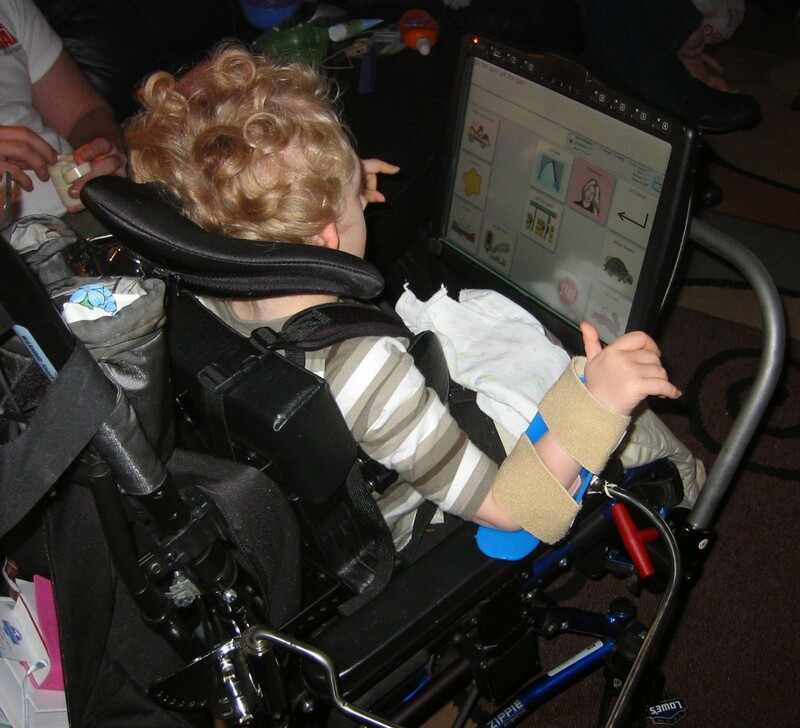 I liked watching his wheels turn as he tried to learn new things. Watching him persevere until he could do something new. I really tried to treasure every moment I had with him, as we knew from the beginning he was probably not going to be our child forever. Ironically, now he is a forever child, forever 4. 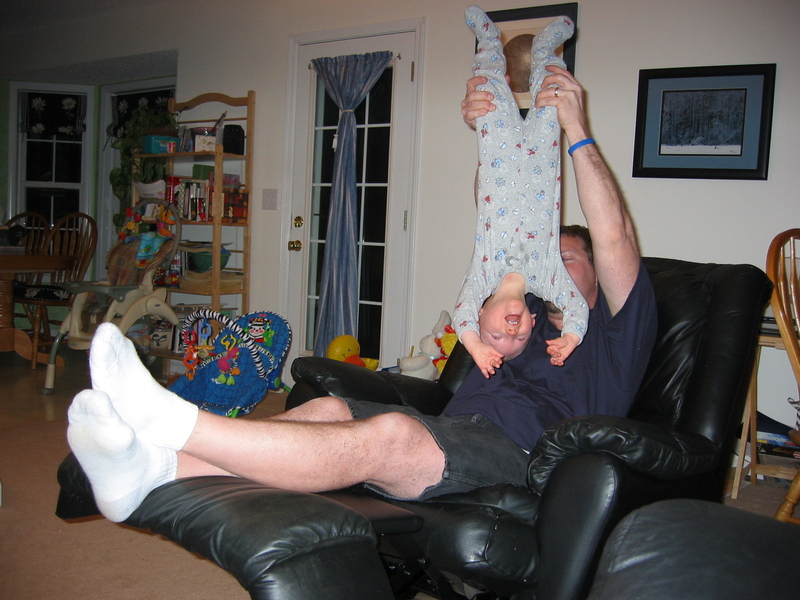 Silly play with Daddy was always good for giggles! Cayden loved his Daddy too, but in different ways. I said before, Daddy was for sleeping and napping. He was for watching NASCAR, and for playing airplane. Daddy was definitely NOT for eating. He started this behavior after Skylar was born and needed her newborn attention. Cayden realized that if he didn’t eat for Daddy, Mommy HAD to come and spend some time with him to feed him. I would feed him a few bites… no problem. Joey would pick up the spoon to feed him a few bites… no eating! He literally would snap his mouth shut and turn away. It was somewhat funny to me because he was communicating loud and clearly. Joey, however, thought it was more frustrating than funny. Don’t tell me that kid wasn’t smart! This stubbornness lasted for at least a year or more. Really. No food with Dad! Working hard on his Elmo picture while standing. Cayden loved to color. 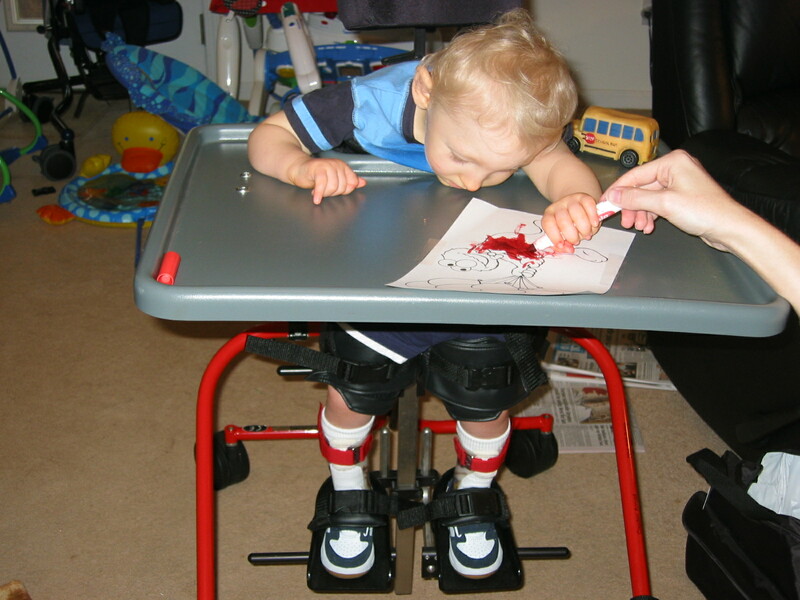 After we got his stander, the favorite activity by far was coloring. He loved it. He would color for an hour if you let him. We would choose a picture to color together. I would pick a handful of markers and allow him to choose which he wanted. We’d put the marker in his hand, and as I mentioned before, he would push the marker back and forth to color the area. He would color the ENTIRE section in, and if he missed a spot, he worked really hard to fill that little hole in. If he slid & went out of the lines, he would fuss, and if I couldn’t calm him down, he would stop, throw the marker down & turn his head away, clearly saying without words “This one is ruined. I need a new one!” My little perfectionist! His favorite thing to color was from his Elmo coloring book & he would always color things exactly the color they were in real life. Elmo is red, Big Bird is yellow. Pumpkins are orange. Apples are red. He was quite specific. Then one day, he colored a zebra blue and orange– a break through! He was finally getting a little creative! Yay! C watching TV on his vibrating chair pad. 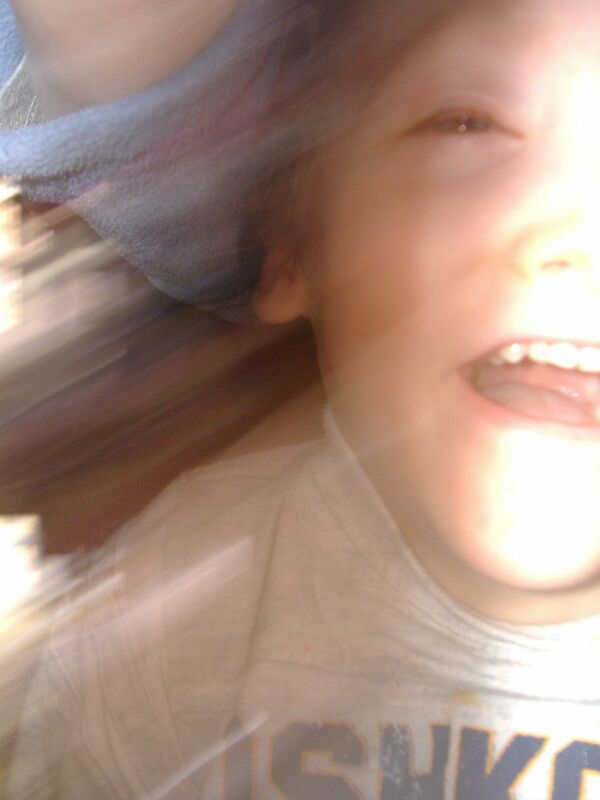 Like many deaf children, he loved vibrations of all kinds. Cayden loved his movies! He watched a lot of movies with all of our driving around. How else was I to keep a hearing impaired child with very little arm mobility busy on 3+ hour drives? I’m not sure how much he understood, not being able to hear the movies, but many are pretty easy to understand even without sound. And he would often giggle at just the right places, so I think they made sense to him. First it was anything Elmo, all Elmo, all the time. Then Baby Einstein videos; we would do his listening therapy while he watched these videos with no sound. Very good for visual therapy! He loved Monsters Inc., Toy Story, and Cars, particularly Cars. Lightning McQueen was his favorite. He died before most of these movies had sequels, but I’m certain Planes would have been his recent favorite! Cayden loved vibrations. Anything that vibrated was a hit with Cayden. From toys, to cushions, to chair pads, to extra loud speakers at church, he grinned when he could feel the floor or the earth move. Like many deaf children, this is a great way for them to interact with their world, and to get some sensation of hearing (without needing aids). We tried to use this to his advantage as much as we could, and I always looked for toys and things that would help him in this area. Baby toys are good for this, so are ‘old lady’ chair cushions & back or foot massagers. C swinging in his Halloween costume at a friend’s party. Cayden loved to move. Especially to feel the wind in his hair (or on his bald head!). 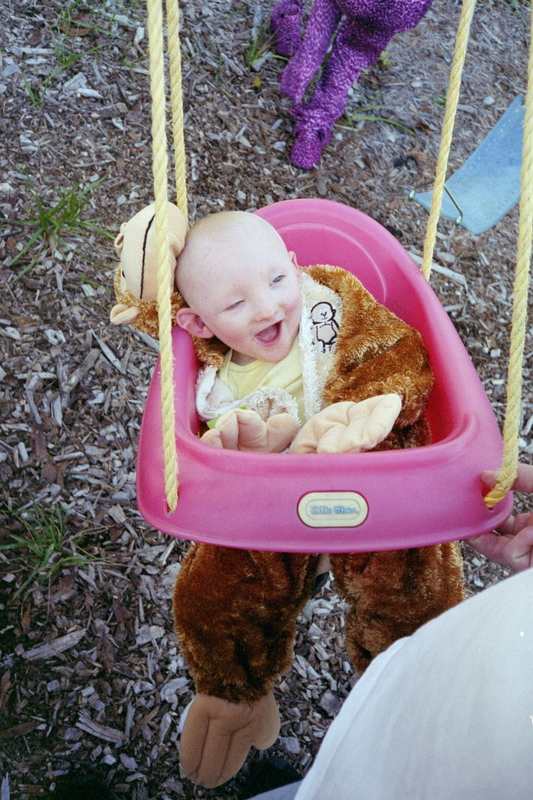 Anything we could do that would give him that sensation of wild movement, with strong vestibular input, he LOVED. He would giggle and ask for more. Swinging was fun. Twisting the swing up as far as it would go was better. Twisting the swing, then pushing it sideways, so it would go crazy while spinning was the BEST! I guess driving the power chair was about the best feeling he’d ever had. One day we were practicing, and I was trying to get him to drive up the street. Instead, he kept going into the neighbor’s yards. Bouncing over the bumpy yards was so much more fun (& more input) than driving on the smooth street. He knew he shouldn’t be driving in their yards, but he couldn’t help himself! Offroading in the power chair! I could see the mischief in his eyes as he giggled the whole way, driving so fast, I had to run to keep up. Wee HA! Working on arm, neck and torso strength while doing equine-assisted occupational therapy. It also was great for his hips and legs. Cayden loved his horses. 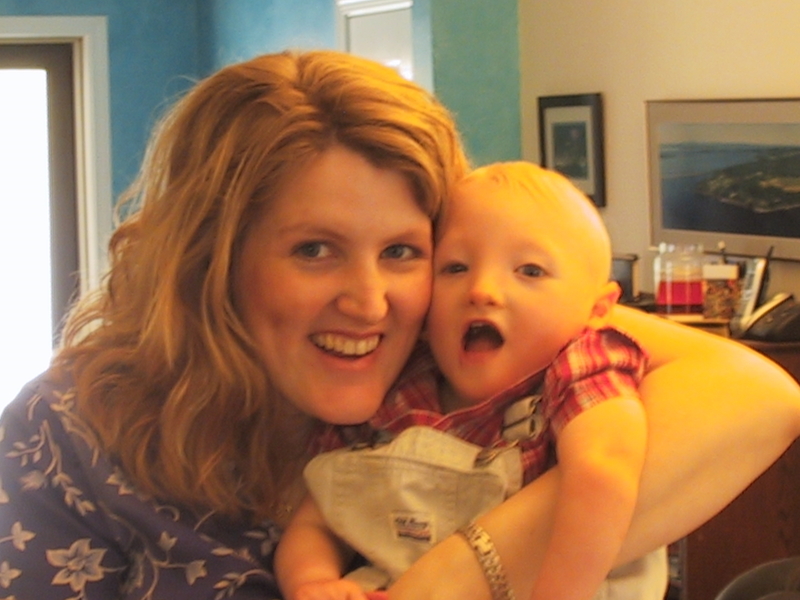 We started Cayden on hippotherapy (equine assisted therapy) which was for him considered his OT. He started this around 3 years old and rode until he passed away. He loved to ride, and weekly we would take the long drive to the barn. The best part for me, was watching him get so excited the moment we turned onto the gravel road that led to the barn. 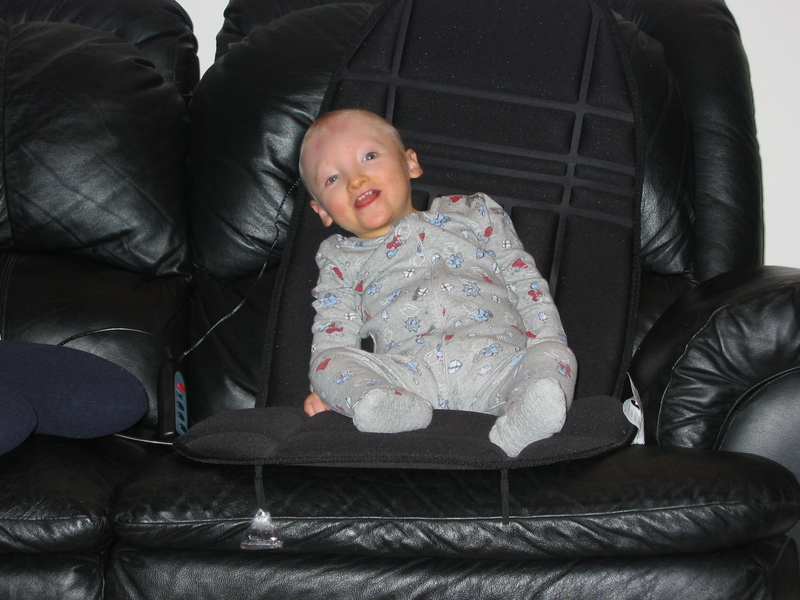 He would arch and pull at his carseat, trying to jump out of the chair. He knew that he was going to get to ride, to pet and groom the horses, and maybe pet the bunny. Sometimes he got to bounce on the trampoline too! So much fun!. When he began riding at Shining Hope Farms, he could not hold up his head. If I held him on my hip, he would flop backwards, unable to hold up his torso. After 9 months of weekly hippotherapy, he could. I could hold him on my hip without struggling. He could keep his head up to meet your eyes. He wasn’t always staring at his wheelchair tray. He progressed! Then we moved and quit riding for a while, until we found a new barn. At Wings of Eagles Ranch Cayden got to take therapeutic riding lessons with a class. He played fun horse games like leapfrog, and trotting around poles. Putting beanie babies in matching houses and other fun activities. He loved the interaction with the other kids and especially loved the games. It was as much work as at Shining Hope, but more fun! 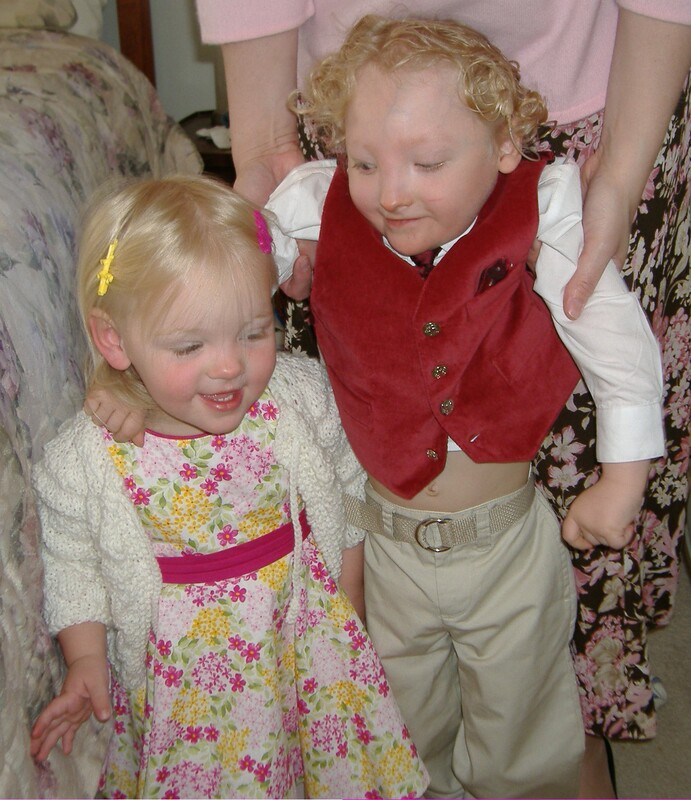 This has to be the sweetest picture of sibling love ever. Cayden loved his sister. 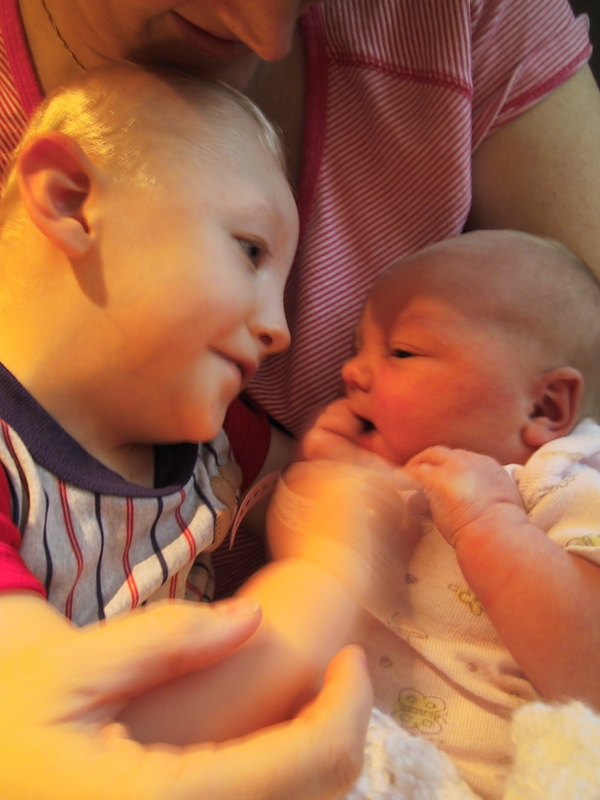 From the moment he saw her at the hospital, Cayden was smitten with his baby sister. He loved her and loved to watch her. 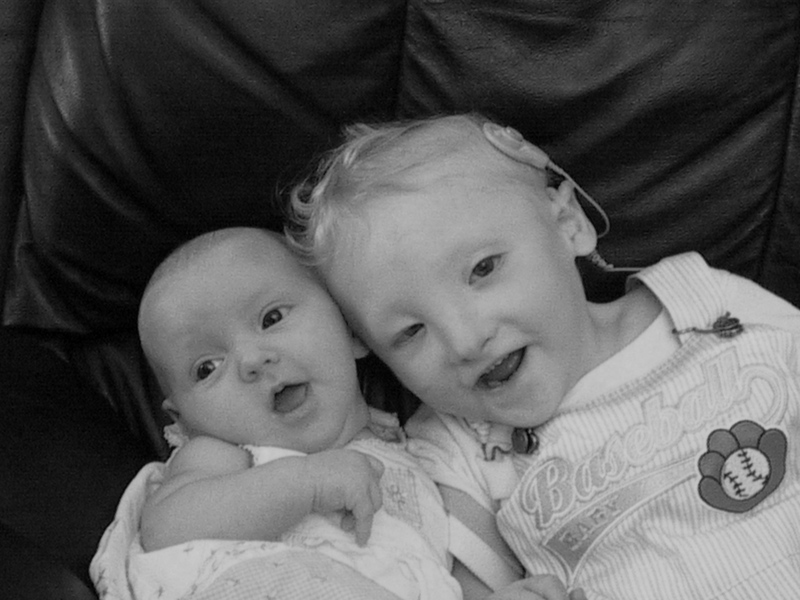 As she got bigger, she would play with him, bring him toys, toddle around on his chairs or standers. She would push him in the wheelchair when she started walking. She adored him and I loved watching their relationship develop. Skylar went to all his therapy sessions and sat quietly and played. Sometimes she would blurt out the answers that Cayden had to work so hard to find the words for. The frustrated looks he would give her were priceless! But she would sit with him, ‘read’ to him, sign with him… it really was a sweet friendship. 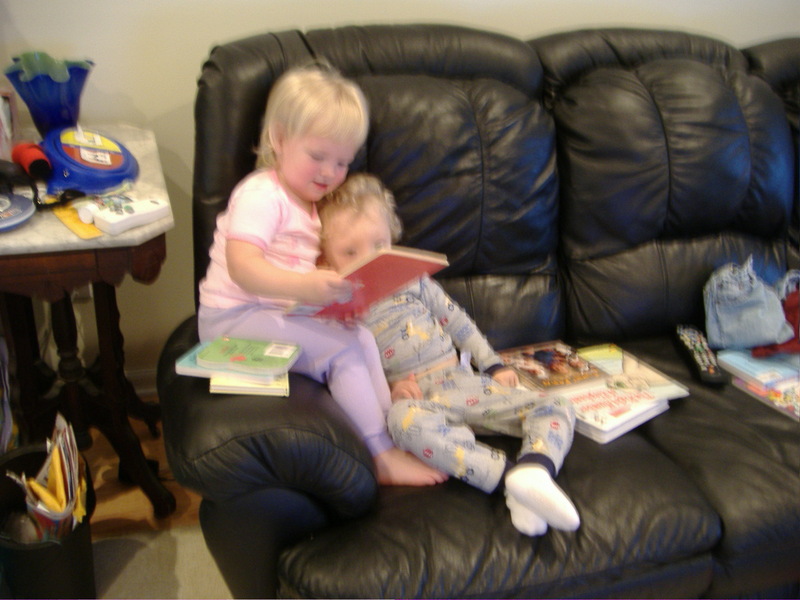 Skylar ‘reading’ to Cayden. She had memorized the books and would tell him the stories. Such a sweet memory! She was with me when we went to wake him up that fateful morning, and just didn’t understand why he wouldn’t wake up and giggle at her like he usually did. Skylar had preschool that morning, so we sent her to school, so we could handle the situation and the grief. We ended up making the hard decision to not have her see his body again, but when we went to get her from grandma’s after school, she immediately said “Where’s CC?” and the explanation had to begin. She didn’t understand life without him, and oh, how hard it was to explain death to a 2 1/2 year old. I hated the fact that my child died so young, but we had been preparing for that day from before he was born. We had already grieved and cried and gone through so many of the ‘what if’s’ that when the dreadful day came, we weren’t completely unprepared. We never really thought we’d have as long as 4 1/2 years with him. We really thought we’d get only a few hours to know him. But Skylar didn’t know that. We hadn’t shared that possibility with her. But now we had to! It was hard! It is hard! I hated that the death of my child, exposed so many of our friends’ children to their first experience with death. Our playgroup, our church friends, our other friends, so many had young children, and we had to explain it, or their parents had to explain why Cayden wasn’t here anymore. I always explained that Cayden had gone to be in Heaven with Jesus, and could walk and talk and run now, that he was perfectly healed. Perhaps it’s good for children to hear the gospel at that young of an age, the truth of Heaven, but I hated that I was the bearer of that harsh reality because of my child’s death. How do I know that he is with Jesus? you might ask. For we know that if the earthly tent we live in is destroyed, we have a building from God, an eternal house in heaven, not built by human hands. Therefore, we are always confident and know that as long as we are at home in the body, we are away from the Lord. We live by faith, not by sight. We are confident, I say, and would prefer to be away from the body and at home with the Lord. We have a home in Heaven, an eternal house, built by Christ. We can be confident that to be away from the body (that is, dead), we are at home with the Lord. How can we be sad at Cayden’s death, when it means for him, to be at home eternally with the Lord? To be made brand new! With a new body not made by human hands. Knowing this, being confident in this, I cannot have a heavy heart. Cayden is made new. He is at his eternal home. Someday, I will join him and we will rejoice together, celebrating birthdays for eternity with Jesus.